When you first bring home an Afghan Hound, no matter how much you researched the breed, spoke to the breeder, and read breed books, you can never really anticipate how your life is about to change. These dogs are truly one of a kind. 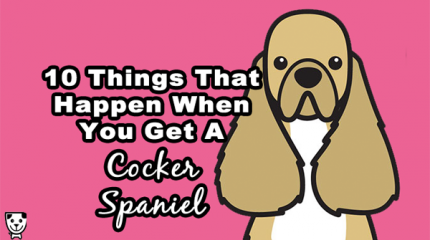 Here are just a few of the things that nobody warns you about when you get one of your own. 1. When you get an Afghan Hound, you become invisible. When you’re out on a walk, everyone will want to admire your gorgeous Afghan Hound. They’ll ooh and ahh, snap pictures and ask you about your dog, sometimes without even bothering to look up at you. You could wear a huge hat, heck, you could even be in your underwear, and all people would notice was your beautiful dog. For long-legged, athletic dogs, a fence is merely a suggestion, a belief system. Most Afghan Hounds can clear a four foot fence in one swift leap. Sometimes, they will seem happily contained in their yard, but once they get the opportunity, they’ll find the highest launch point along the fence line and leap over to the other side in pursuit of a cat or rabbit. 3. It’s not as much fun to snuggle them in the summer. On cold nights, it’s wonderful to snuggle with a Afghan Hound. That long, silky fur feels incredibly cozy and warm. In the summer, however, you’ll both quickly overheat. You can have their coat clipped in the summer, of course, but they’ll still be warm and fluffy. Some people can’t sleep without their hound no matter how hot it is, it just becomes a comfort reflex. 4. Afghan Hounds are sensitive. 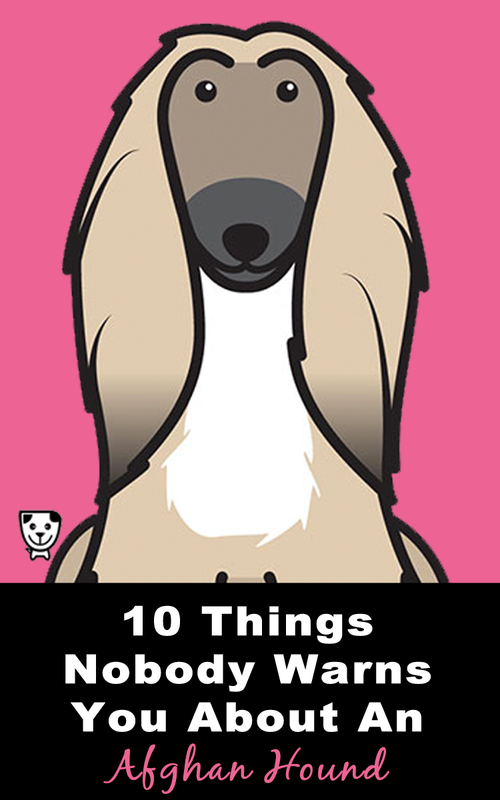 If you move house, your Afghan Hound will likely be the last member of the household to fully adjust. They do not take kindly to change, and they’re slow to trust strangers. Routine is a hound’s safe space, as are their favorite people. 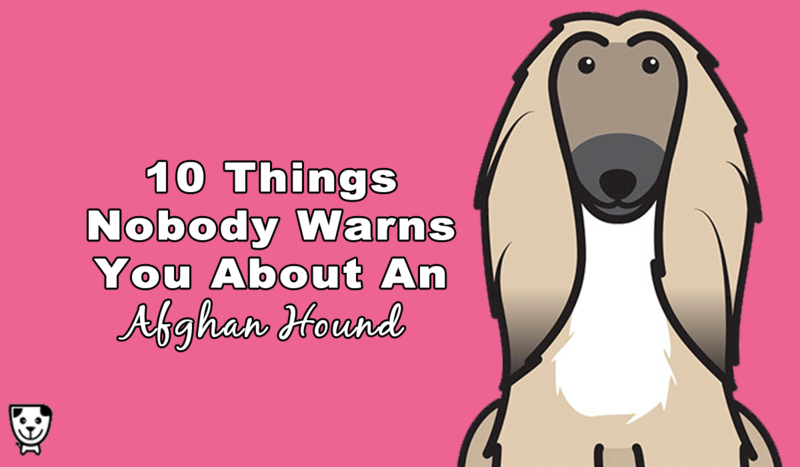 Unfamiliar environments and unexpected noises make an Afghan Hound nervous, but they’ll guard their beloved humans with their own life. 5. Their ears are always in the way. An Afghan’s long ears make them all the more beautiful, but they will constantly fall into their food and water. There’s really nothing more special than that moment when your Afghan walks up to you for pets and their wet ears drip all over you. 6. They look good in anything. The wet ear problem simply means that you have a wide variety of options for keeping your Afghan’s ears clean and dry. They look extraordinarily elegant in hoods and scarves. Really, anything an Afghan Hound wears becomes high fashion. That modelesque physique can make the silliest doggy pajamas look like experimental runway couture. 7. An Afghan Hound knows they are beautiful. Though they have all of the typical dog tendencies, like rolling in dead animals and getting muddy, an Afghan has a sort of understated (ok, maybe overstated) natural grace. They are stunning, and they know it. Unlike other dogs, they won’t jump through hoops to prove their loyalty, and they won’t do just anything for a treat. They’re the one breed of dog that knows they’re “worth it,” and it’s obvious from the way they carry themselves. 8. Afghan Hounds are actually very clever. Many people believe that the Afghan Hound is at the bottom of the list when all of the breeds are ranked in order of greatest intelligence. The truth is, the top-ranked dogs are the ones that are bred to be highly motivated by food, and easily biddable. Border Collies and Labrador Retrievers are easy to train, and they’re wonderful dogs, but that does not mean they are the most intelligent. Afghan Hounds were bred to hunt independently, leading their humans to the prey. There’s no easy way to define canine intelligence, but if it were defined by the ability to make decisions and learn new concepts quickly (when given the right motivation), the Afghan Hound would top the chart. Like all sighthounds, Afghan Hounds have a slight build and are able to run very quickly. However, nobody tells you that they don’t just sprint for short distances, they are able to keep up a fast pace for miles. They were bred to have incredible endurance while hunting, and it takes a lot to tire them out. They’re also very sneaky, able to swiftly steal and eat an entire slice of pizza before you even notice it’s gone. 10. That feeling you get when you look into their eyes. Afghan Hounds have so much love and light in those big brown eyes. There’s so much intelligence and personality behind them, that you almost feel as though you’re looking at a human being. It’s something that you never quite get used to, even after years of living with one of these hounds. Download my Afghan Hound cartoon! I had to smile when I read this, it is all so true. The one that really gets me is when people say that afghans are dumb because they don’t rollover and play dead, like many dogs can be trained to do. Instead, they are very independent and stealthy. One of mine, loved taking things out of my purse, or reaching up on the countertops and snatching something and then go to the other side of the room and tossing whatever she got up in the air to say, haha, look what I have. I guess you would have to own an afghan to realize just how intelligent they are. Although it has been a number of years since I was owned by an Afghan, every one of “the 10 things” is so true. There was never a dull moment. To this day I miss his sense of fun. Don’t ever let anyone tell you they are dumb or stupid. They are wise and stealthy. 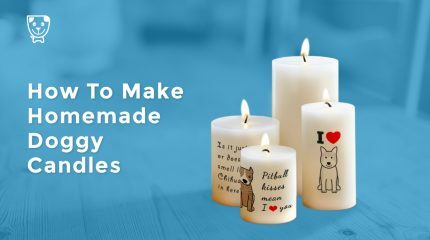 All so true – reading this made me smile, laugh, even bring tears to my eyes. They really get what it means to share your life with an Afghan. Our Tiffy is a celeb dog – I really can’t walk down the street without stopping and letting people admire, pet and windwr at her. She even has her own Instagram page. But the one comment that really touched me was the part about gazing into their eyes. The depth, the empathy, and if course their intelligence. There is no other dog that is more amazing than an Afghan! For over 50 years I have never been without at least 3 afghans, and at the moment we have 4. They all live in our home with us, and share everything we have. Their thinking is, what is yours is mine and what is mine stays that way. All the things written above are completely true, but there is even more about the afghan which is totally unique to this wonderful breed. If you are on the afghan’s wavelength, you will always have a smile on your face, whether it has done something naughty, ingenious, or if it’s just lying on your dining room table among the crockery looking innocent and gorgeous, that smile from you will be there. I love this post! My Duke passed a while back but the post is on point, made me smile because I remembered the things we went through when Duke was with us. My kids (now adults) and family still talk about him even though it’s been a few years he’s been gone. Miss you Duke! Beautiful dogs, love reading about this breed. Just one question, how much grooming is involved to keep their beautiful coat. I have 6 afghans hounds and they are all with a peculiar personality! I look forward coming home to them and they make me feel the most important person within their world! During my recuperation from open heart surgery and surviving Cyclone Maria at the same time; they were the most patient ever and they behaved like pros! I got better quicker thanks to them! As a former Animal Control Officer, I can surely attest to all of the above. I’m always explaining why they’re me favorite breed and exposing the “stupid dog” fallacy. An Afghan owner must be mentally stronger than the dog, or risk being taken over. So true! I always said my Afghan was always thinking. If I wanted the bone under the blanket, I could get it myself. I got my first Afghan 2 years ago and my second just shortly after that. I have wanted one since I was about 5 years old when I first laid eyes on them. I can not imagine my life without out one and I can not imagine ever not owning one in the future. We have had all sorts of dogs but loving an Afghan is like being in love for the first time. I laughed so much reading this article and loved the description of looking in their eyes. So true all of it. Thanks for sharing this wonderful post. All of the above is true, I have loved living with Afghan hounds for 40 years and the appreciation and love for them has never diminished, if anything it has grown, if that is possible. I could never be without one of these very special hounds.